Positive Health has been initiated by Body Positive as support scheme to assist people living with HIV to pay for medical fees and associated healthcare costs. 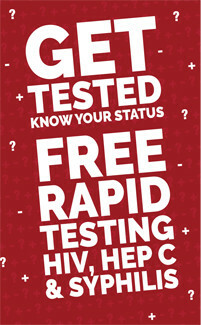 The scheme is available to anyone living with HIV in New Zealand. To access this scheme just complete the appropriate documentation at Body Positive, receive your Positive Health ID Card and then present this to the doctor or service provider for payment. The cost will then be automatically referred to Body Positive for payment. What is the Positive Health Scheme? Body Positive understands the importance of everyone living with HIV being able to visit their doctor whenever they need too, however for some the doctors consultation fee can act as a barrier as their disposable income may be limited. To help with this problem, we started the Positive Health Scheme, so that members on a benefit or with a limited income within the scheme can go to their doctor at any time without having to stress or worry about the cost. Under the scheme, a member simply presents their current Positive Health ID Card at the doctors to have the consultation charge (to a max of $40 per visit) referred to Body Positive for payment. If your current doctor charges a consultation fee of more than $40, you will need to pay them this additional cost directly to the doctors clinic, Positive Health will still pay $40 of the bill - So if your doctor charges $46, you will need to pay $6 and Positive Health will pay the remaining $40. As it is also very important that people living with HIV collect and take their medications as prescribed, the scheme also covers all Pharmacy Prescription Dispensing Fees (usually $5 per medication) for prescription medications either from their doctor or HIV Specialist. The scheme DOES NOT cover any other over-the-counter pharmacy purchases other than the standard prescription dispensing fee. The scheme DOES NOT cover any non government subsidised medications that you might be prescribed by your doctor. Does Positive Health cover any other costs? Please see the Important Info section or full details on what is covered for each of the above. What doctors and service providers are part of the scheme? We understand that many people have a close longstanding relationship with their existing doctor. Because of this there is no restrictions within the scheme as to which doctor you can use. Most doctors and pharmacies will happily forward consultation fee and dispensing fee charges to Body Positive for payment, however there may be a few who will require payment be directly. If you doctor or pharmacy requires a direct payment, simply make the payment and forward us the receipt so that we can arrange a reimbursement. All other services covered by the scheme, such as massage, counselling etc. is only available via a pre-approved service provider. Please refer to the approved providers list for details. The Positive Health Scheme is available to anyone living with HIV in New Zealand. For more information or to join simply contact us and we will take care of all the arrangements for you. The annual fee to join the scheme is $200, this can either be paid privately via a one off payment or may be available through Work and Income via a redirection of your benefit, depending on your circumstances. For premium users, Body Positive reserves the right to discuss a premium fee in addition to the regular fee charged. There is an application form to fill in and acceptance will be sent to you with your Positive Health ID Card. It is important to make the distinction that the Positive Health Scheme IS NOT a form of Healthcare Insurance. Positive Health is a fund managed by Body Positive to designed to assist people on a benefit or with limited income to seek basic medical treatment when needed. So that the fund is sustainable and does not open Body Positive to undue risk, it cannot run at a loss. Members who's bills greatly exceed there payments into the scheme will be asked to move to a High User Premium account to continue using the service. Some members have more serious medical conditions, that require a lot more medical attention. If you make many and regular visits to your doctor then it may pay to discuss this with Body Positive who could check that your WINZ Disability allowance is sufficient to meet this extra expense. In these situations Body Positive will assist you to ask WINZ to increase your Disability Allowance to meet this cost and accordingly increase your redirection to Body Positive from $5 per week to $10 per week. For those who pay privately for the scheme, this increases the annual payment from $200 to $400 per year. After we have received the annual fee and the completed documentation you will be issued with your Positive Health ID Card. Use this card at any of the participating healthcare providers listed in this publication for your costs to be referred back to Body Positive for payment, subject to any special conditions associated with the provider or service as detailed. If your original Positive Health ID Card is lost, damaged or misplaced, please contact Body Positive immediately so a replacement card can be issued for you. A small fee of $10 will be charged for each replacement card issued to cover the costs involved.